Where can I check my B&Q gift card balance online? Here: You can check your B&Q gift card balance immediately online on this page of the B&Q website. B&Q trivia – B&Q stands for Block and Quayle – the names of the original founders Richard Block and David Quale. Nowadays, B&Q is a multi-national DIY retailer with stores across the World including Ireland, and Taiwan. It is the largest DIY retailer in China, as well as holding the number one spot here in the United Kingdom. B&Q has 359 stores in the UK, so there’s probably one near you – you can check by using their store finder. Where can I spend my B&Q gift card? Where can I buy B&Q gift cards? You can pick up B&Q gift cards at any B&Q store in the UK. You can find B&Q gift cards at some supermarkets, including Morrisons. 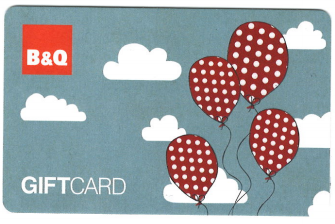 You can purchase B&Q gift cards at the B&Q gift card website. These are sent by post in 2 days. Postage is £2. You can get “electronic” vouchers by email from the B&Q e-gift card website. These are sent by email for you to print and take to the store. These can be sent immediately or you can have them sent at a date in the future. You can also email them directly to someone else to give as a gift, very nifty. What else do I need to know about B&Q gift cards? The card is valid for 5 years after which time you will lose your balance. However the terms state you can restart the clock on this by doing a balance check, so if you are unsure you should go to the B&Q website to check your balance – this way you’ll know the card is valid for 5 years again! What about B&Q decorating cards? If you want to check the balance of a B&Q Decorating card you can use the same balance checker above. Please note that B&Q Decorating Cards generally have shorter validity periods, and may expire 12 months after issue – so check the terms and conditions which are printed on the back of the B&Q decorating card you have received.